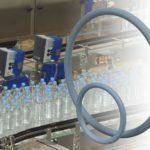 Swirl Air nozzles from Delavan will help users in chemical and process industries maintain process continuity, increase plant productivity, quality, product yields and meet stringent environmental standards. Now the company is bolstering its technical service with dedicated technical support from industry sector specialists. Delavans sector specialist, Andy Nixon explained, Client spray nozzle requirements vary greatly depending on their plant set-up, production or environmental objectives. Nozzles for gas cooling, for example, need to deliver liquid in volumes proportional to flue gas flow with even distribution and small droplet size. This ensures complete evaporation of the droplets for maximumcooling, but without residual excess fluid use or wetting that could harm the plant. Swirl Air nozzles provide flow rates from one to 2,400 gallons per hour and spray angles from 50 to 100 degrees with precise control of droplet size. Applications arise in chemical, petrochemical and process industries such as flue gas cooling or gas conditioning to remove harmful gasses or particulates. Delavan engineers work closely with end users and the manufacturers of process equipment and environmental control systems to select nozzles that optimise flow, distribution, and droplet size to meet the users objectives. Swirl Air nozzles provide the adaptability to meet variable process requirements. There is a correlation between exhaust volume and temperature and Delavan nozzles have the capability for flow adjustment so that output can be fine tuned to meet the prevailing requirement. Operational needs are important. Nozzles will therefore be selected that offer extended service life and minimise maintenance downtime. As a nozzle specialist, rather than a provider of off-the-shelf turnkey systems, Delavan are able to take into account fully, the clients air and liquid delivery systems and recommend nozzles to optimise system performance. Swirl Air nozzles need just two inputs, the spray liquid and the propellant gas. This propellant is usually air but could be an alternative gas or steam depending on process requirement or availability. Compressed air is introduced tangentially into the spray chamber to swirl round at high velocity. Primary atomisation is achieved as the liquid passes through the swirling air. This stream then passes through a precisely engineered structure, comprising the orifice and pintle plate. The change in pressure and stream direction causes secondary atomisation and creates the precise distribution pattern and droplet size required. Compared to pressure driven nozzles, Swirl Air nozzles achieve comparable levels of atomisation at much lower pressures. 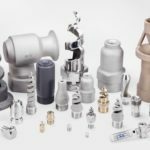 Delavan has invested heavily in tooling to ensure nozzles are manufactured to precise tolerances and with exceptional levels of surface finish. Nozzle bodies and caps are usually manufactured in long-life 316L and 440 Stainless Steel. Various grades of Hastelloy, Titanium and Inconel are available for applications with high temperatures or acidity. Critical wear components can be easily changed without dismantling the nozzle. For extreme conditions with aggressive particulates, carbide lined nozzles are available. Engineered accessories include lances to ensure perfect nozzle position. These may be heated, cooled or insulated where this is necessary. Delavans catalogue of over 30,000 pre-engineered nozzles and components are ideal for many processes including cooling, drying, cleaning, coating, misting, dosing, aeration and environmental control. Technical service is available via Delavan or authorised representatives throughout the world.